View AD user properties and export a list of Active Directory users to migrate, reporting, auditing etc. The AD Browser software is designed in consideration of AD user requirements. It makes the task easier for both technical and non-technical Active Directory users to analyze and view data. Active Directory Analyzer Tool is capable enough to search Active Directory details of multiple users using its bulk mode. With this Active Directory viewer tool, one can get a clear view of user properties that are assigned for a specific user profile in a domain. The software works regardless of the total number of users created within an Active Directory domain. Hence, one can perform a search operation for a particular profile and user properties using this analyzer utility. 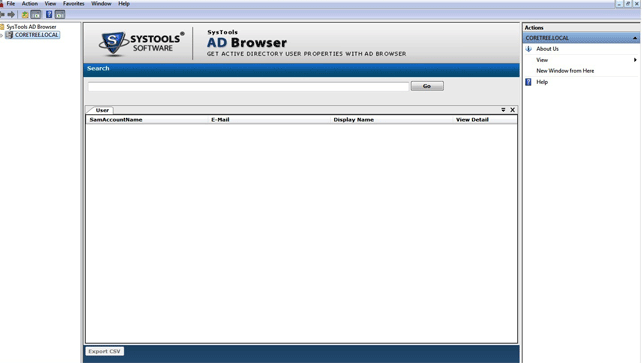 With this AD Browser tool, one can view AD user properties and other details of an AD created user profiles. As the tool is designed with highly programmed algorithms so that it provides search accessibility permissions and restrictions. The software allows users to view Active Directory user properties in two different modes. One can view the AD properties in HTML or Raw mode with the help of this advanced tool. This option makes this Active Directory Analyzer tool more efficient. Once after viewing AD properties either in HTML view or Raw mode, users can extract Active directory data to utilize it in the future. The extracted information can be saved into CSV file format that is accessible from Windows operating systems. 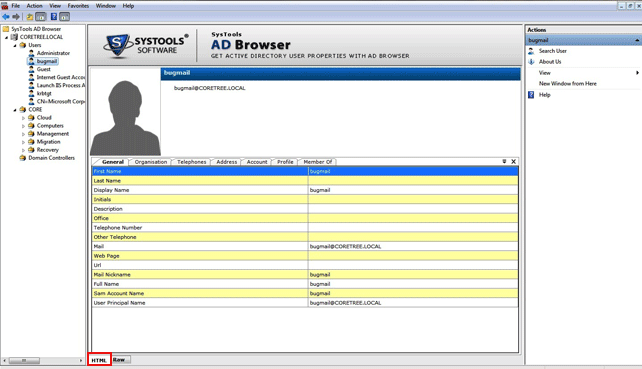 The AD Browser tool provides a complete information of the user attributes. It renders complete details and it views AD user properties as well as user profile of an Active Directory Domain along with sheer perfection. For this, one can use its search option. How to View and Extract AD Properties of Multiple Users? Q. Can I save multiple user details for further utilization? Ans: Yes, with the AD Browser is capable to extract and save the user details locally. One can save the data as CSV file format using this Active directory Viewer software. Q. Is it possible to extract user details from AD without AD Server? Ans: In order to view and extract Active Directory user properties, AD Server must be present and activated on your local machine. Q. Is there any option to search for a particular AD user? Ans: The AD Browser software is an efficient utility that includes the option to search for a specific user profile and user properties. Q. How can I search accessibility permissions of the AD created user profiles? Ans: Using this Active Directory Analyzer Tool, you can search the access permissions as well as restrictions. 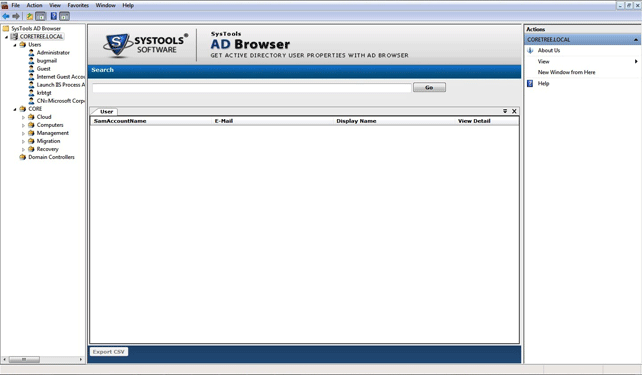 The AD browser tool provides a complete view of AD user properties and details of created Active Directory user profiles. Q. Can I use this AD Viewer software on Windows 10 (64-bit)? Ans: Yes, the AD Browser software can be simply installed and run on Windows 10 (both 32 and 64 Bit) and all below versions without any inconvenience. It would not be wrong in saying that Active Directory Analyzer Tool helps me out in the most problematic condition. With this amazing software, I have extracted and viewed Active Directory user properties of multiple users within a few minutes. The best feature I liked in this application is its interface, which is so simple and understandable. search led me to your powerful Outlook PST Repair Software that did just what I wanted and how I wanted. Thank you Team! How to open and save the list of all users inside AD with details is all I was thinking last week. Luckily, I found this AD Browser utility while browsing and I must say it is actually a reliable product. It allows me to view as well as export User details in CSV file format. I would like to suggest it to all users out there who wants to check and extract the AD Properties. Simply great is all I want to say about my first experience with this AD Viewer software for Windows 8. It displayed me a complete list of all users within Active Directory along with details. This Active Directory Analyzer Tool makes it easy to search a specific user from the list of AD Users. Its easy GUI attracted me a lot while I view AD user properties.